Open reading in which several of us will participate follows Grace Cavalieri's reading 6:30 Saturday, December 9th, at Evelyn's in Annapolis. 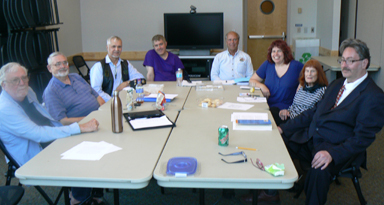 Will be able to read a couple of poems from Harbingers and Babuska's Beads this Saturday in Annapolis as a couple of participants from my Saturday workshop at Jack Bay offered to drive me. 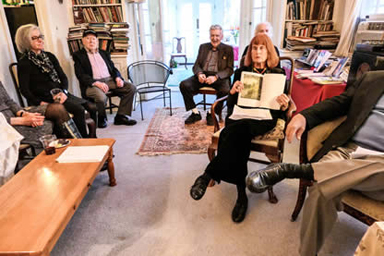 Calvert's Crack Literary Team of Ritchie and Farnsworth New books by each open a Bay Weekly conversation By Sandra Olivetti Martin. "Together, Elisavietta Ritchie and husband Clyde Farnsworth have written an encyclopedia of words, with more spilling out every day. Poet, storyist, translator and mentor Ritchie has just published her 22nd (or so) book, the poetry volume Harbingers. 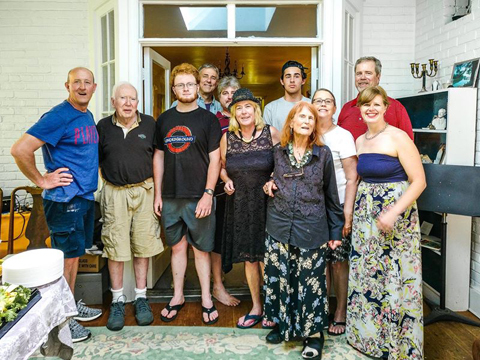 Retired New York Times foreign correspondent Farnsworth has just published his fourth, the father-and-son biography and autobiography Tangled Bylines." The BAY WEEKLY this month contains editor Sandra Martin's big interview with Clyde Farnsworth and Elisavietta Ritchie. Everybody's got a book in them? Maybe so. Certainly we've all got stories. But the difference between a story and a book is getting it done. Many, many hours at a keyboard stand between most of us and that destination. That's after (actually, before and during, too) the spinning roulette wheel of all the stories that could be told stops on just one. Then you've got to figure out where that story starts. Then keep – and keep, and keep – writing it. All the while, of course, you're worrying about who you can get to publish it. So the fact that any book ever gets published is a minor miracle. In this issue, Bay Weekly looks into that miracle multiplied, in one of our authors' cases, like the bread and wine of the marriage at Cana. 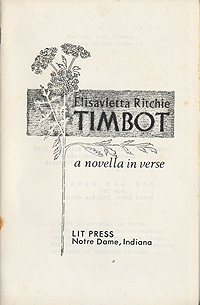 That literary engine is Elisavietta Ritchie, celebrating the publication of her 22nd book. Name sound familiar? Could be for lots of reasons as the poet, journalist, novelist and writer of short stories, translator and mentor has her hand in many literary pots. One is Bay Weekly, where you've seen her stories over many years. Poems now and again, too, for Elisavietta bombards me with poems apropos many a subject and occasion. Just last week, she responded to a Bay Weekly Creature Feature with eight poems on spiders. Maybe you know her as your teacher at Calvert Library, where her memoir and creative writing classes have encouraged many a story out of its keeper and into print. Many of those stories, too, have appeared in Bay Weekly, including many from our long-time contributor Sandy Anderson, lost, alas, to all of us this spring. 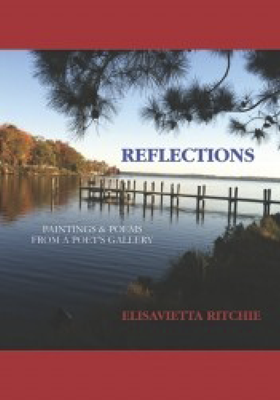 Maybe you know Elisavietta as collaborator, for many of her books of poetry feature the work of local artists, photographers and designers, for instance Megan Richard and Suzanne Shelden. Or as the editor — at Washington Independent Writers — who might hold the key to your literary future? In this issue you'll get to know her better and learn some of the secrets of her literary success. High among the bodies longing to write books are journalists. Elisavietta's husband Clyde Farnsworth, retired from the New York Times, proves that rule four times over. This week Bay Weekly features Farnsworth and his latest book, Tangled Bylines. It's the story of Clyde H., our Clyde, and Clyde A., his father, both foreign correspondents who together reported on history in the making during the second half of the 20th century. Read it for history told from a first-person-present human perspective by an erudite journalist who tells not only the story but also the story behind the story. Among the many stories Clyde has packed into his 300-page-book is the tangled personal story of a son and his absent — but oft reappearing — father. Elisavietta and Clyde are the sorts of people youíd expect to write books, aren't they? So we balance the scales with the everyday guy so inspired by a story — this one made up, by the way — that he put in the discipline to make it a book. You may know Thomas Michael from the aisles of Graul's Market Annapolis, where he's a manager. You'll meet another aspect of Michael — the writer angling for a movie contract — in Bob Melamud's profile of the author and his mystery novel Birdland Murders. Adding to the fun in these World Series days, our own Orioles' Minor League clubs and ballparks are the bloody settings of Birdland Murders. Read, enjoy — and maybe give your own story a nudge toward the book it wants to be. September 16th! A coming out party for HARBINGERS at the Bulgarian Embassy. 1960 to 2017. 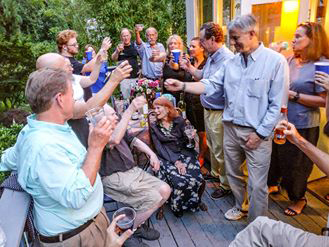 EPIC, end of an era, party at the family home on Macomb Street, Washington, D.C. New Chapter. New Challenges. Photos below taken by Nataliya Rostova. William Rivera & Elisavietta Ritchie will read at 7 pm, Thursday, 28 June, at Kensington Row Bookshop, 3786 Howard Avenue, Kensington MD 20895, 301 949 9416. www.kensingtonrowbookshop.com Open reading follows. 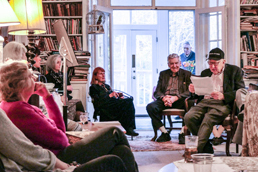 Both have travelled widely and studied, lived and worked abroad, but both also are long active in literary circles in the Greater Washington Area. Their work appears in Innisfree, Gargoyle, Loch Raven, and many other publications throughout the world. William Rivera lived many years in Mexico and France. etc. 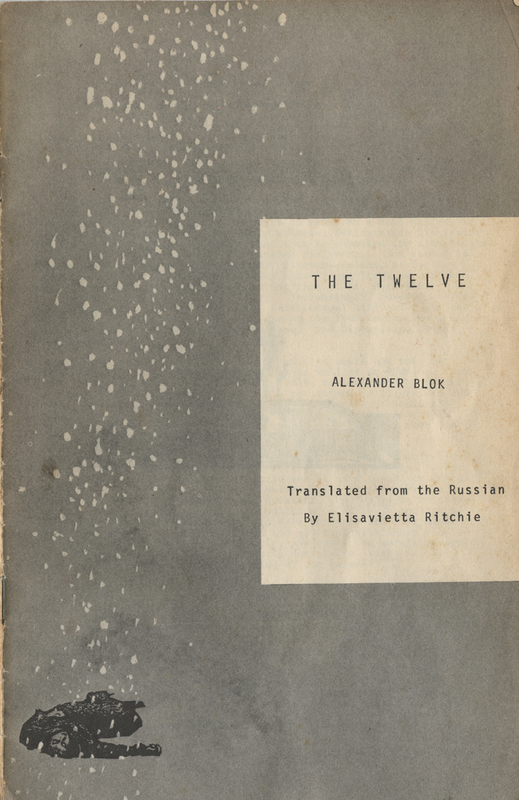 ; and four collections: Noise (Broadkill River Press), Buried in the Mind's Backyard (Brickhouse), The Living Clock (Finishing Line), and his new CafÈ Select (Poet's Choice). 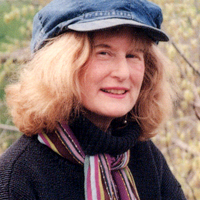 Elisavietta Ritchie, long a workshop leader and poet-in-the-schools, has lived in Australia, Canada, Europe, the Middle and the Far East, as well as Washington and on the Patuxent. She has twenty books and chapbooks of poetry, with two of Stories & Half-Stories. Her latest titles from Poetsí Choice Publishers are Reflections: Poems on Paintings, A Poetís Gallery; and Babushka's Beads: A Geography of Genes, on her Russian ancestors. Her new collection, HARBINGERS, is in press, also with Poet's Choice. Elisavietta (Lisa) Ritchie and Clyde Farnsworth are turning over the legendary Macomb St House to a new family. This house has been the venue for numerous literary salons, musicales, parties and less reputable activities for the last 58 years. Only if convenient, bring a bottle of what you like to drink and nibblies to help the celebration. Logistics: there is street parking. 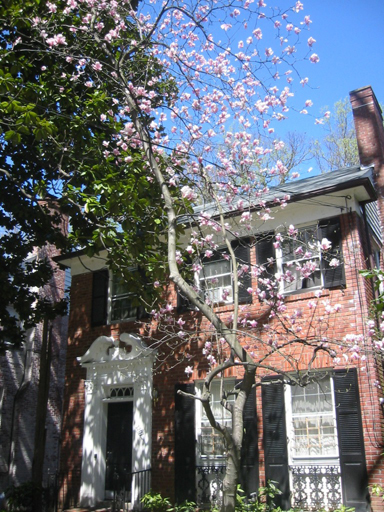 The house is about 3 long blocks from the Cleveland Park Metro. The walk is pleasant. As usual your poems are marvoulous examples of fantastic writing. You appear to be as busy with your many projects. I trust you have the time to welcome in and enjoy the unfolding spring and forthcoming summer days! Should you ever like to recommend another poet to send their work, I'd certainly appreciate. We already have poets from some 7 countries for the next issue with many of our continuing contributors yet to submit. Harbingers! A new book emerging. Lisa Ritchie is working with Poets Choice Publishing and hopes to complete this new book in the coming months. Working with Shelden Studios to produce a Revised edition of Timbot, A Novella in Verse. We have posted the old version to this link. Very excited about the new edition taking place within the next couple of months. 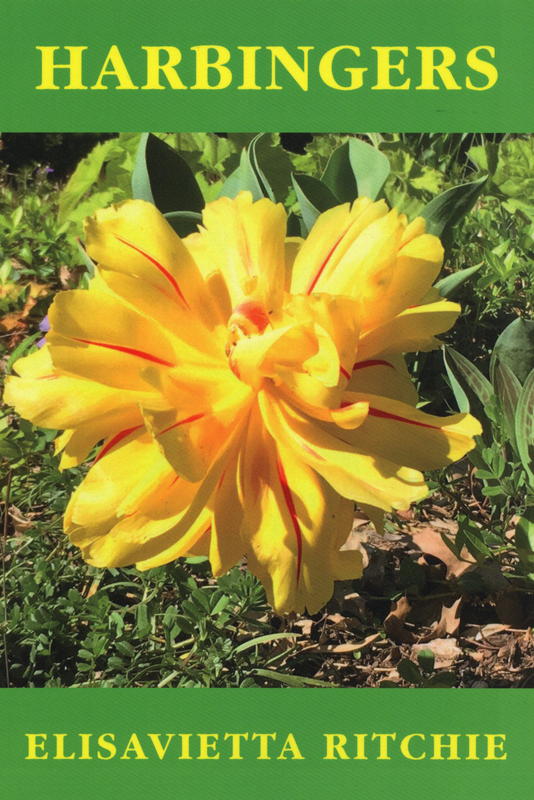 Recent acceptances from Topology journal; Ann Arbor Review; The Bay Weekly; Along the Shore anthology from Lost Tower Publications (which also took poems for several other anthologies edited by Harry Yang: Beyond the Hill, The Poetry of Flowers, Greek Fire, And The Tail Wagged On, Temptation). Calvert Library in Prince Frederick has a special exhibit for Poetry, including my book, Guy Wires! 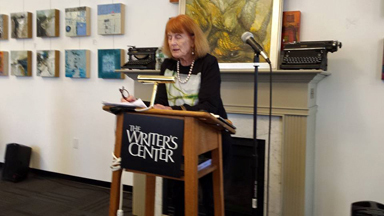 Successful Book party on the birthday of Clyde H Farnsworth's father, Clyde A. Farnsworth, on Thursday, March 23, for both Clydes' TANGLED BYLINES and Elisavietta Ritchie's two books published in 2016, BABUSHKA'S BEADS: A GEOGRAPHY OF GENES and REFLECTIONS: POEMS ON PAINTING, A POET'S GALLERY. Also celebrated Cameron Ritchie's birthday, and her own many books. BOOK PARTY! Clyde's Book Tangled Bylines arrives several weeks sooner than expected!everal weeks sooner than expected! 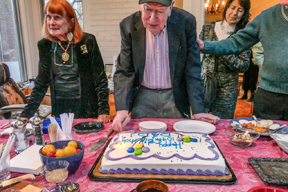 Book party is on the birthday of Clyde's father, Thursday, March 23, 5pm onward, for both TANGLED BYLINES and my two published in 2016, BABUSHKA'S BEADS and REFLECTIONS: POEMS ON PAINTING, A POET'S GALLERY. Also celebrating Cameron's birthday, and her own many books. click here to read it. Join my community. "Rewrite Your Life—Or Someone Else's"
I know you are scattered, but perhaps you want the excuse to hide and write. So wherever far-flung spot you are, peruse, and with luck something here will jump-start your own writing. Just get it down, pencil on paper thence to brain, before you hit the computer to type it up! Bring about ten copies of up to 800 words (but have more in reserve in case we have time for more). Meanwhile wherever you are, stay hard at work creating, reworking, reading and with luck publishing! My missives to you all are getting longer and longer but I keep coming across interesting articles and poems to share. And events!